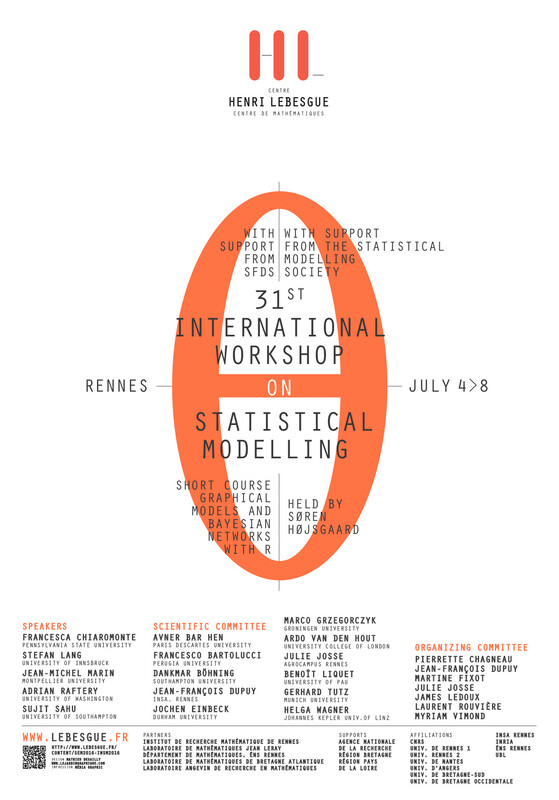 Welcome to the webpage of the 31st International Workshop on Statistical Modelling (IWSM). The 31st edition of the IWSM will be held in Rennes (France) from 4 to 8 July 2016, hosted by the Institut National des Sciences Appliquées. IWSM is one of the major activities of the Statistical Modelling Society, founded with the purpose of promoting and encouraging statistical modelling in its widest sense, involving both academic and professional statisticians and data analysts. Since its first edition, the spirit of the workshop has always been to focus on problems motivated by real life data and on solutions that make novel contributions to the subject. The atmosphere of the workshop is friendly and supportive, with no parallel sessions, with the aim of stimulating the exchange of ideas and experiences related to statistical modelling. As a sign of positive feedback the IWSMs report many returning participants. Papers focusing on applications with important substantive implications as well as methodological issues are welcome. Submissions by students and young researchers are particularly encouraged. New information about the 31st IWSM will be continuously added on this website. If you have any questions or comments, please contact us.